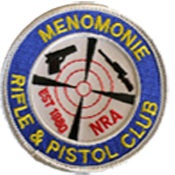 While the county has set the possible hours the range may be open, the range is only open during supervised hours of operation that volunteers of the Menomonie Rifle and Pistol Club have offered their time to operate the range. Those hours are posted on the calendar. Suggested Range Use Donation is $5.00. All donations are used for range expenses and range improvement projects. The range is wheelchair and handicap accessible. 100, 200, and 300 yard shooting benches. The 100 and 200 yard firing benches have adjustable seats. The 4 dedicated pistol shooting firing points are handicapped accessible. A 5-station 16- yard regulation trap range is installed, but is only open during certain hours. Check the calendar for the dates and times. At other times, a clay target thrower is available, but shooters must bring their own clay pigeons. Paper targets only on the rifle and pistol ranges. targets are available at the range house. Cardboard is provided for the target stands. Hearing and eye protection, rifle rests, spotting scopes, and sandbags are available at no charge. For safety, County ordinances require all firearms be unloaded and in a case while being transported between the parking lot and the firing points. Also, a Range Supervisor must be present for anyone to be on the premises. INDIVIDUALS FOUND ON THE RANGE DURING UN-SUPERVISED TIMES ARE SUBJECT TO ILLEGAL TRESPASSING. Members are instructed to call the County Sheriff if people are found on the range without a Range Supervisor present.